We somewhat overslept this morning, missing the free hotel shuttle down to the entrance to Petra. Neither of us was particularly bothered about this since we were both very tired from yesterday’s travelling anyway and the extra time spent recharging our batteries was well deserved. We left the hotel shortly before nine and went in search of somewhere to get a good breakfast. Alas, our search was fruitless, as we couldn’t find anything so we grabbed a taxi down the hill to the Petra ticket office instead. It was the third taxi that accepted out half Dinar offer for the two-minute ride – which just happens to be the going rate anyway. Luckily, our student ID cards were good for a nice discount on the already substantially discounted entrance tickets to the ancient site. With tourism at an all-time low here, the ticket prices have been slashed to attract more tourists. In times past, a ticket into Petra would have set us back a whopping $40 each but we only paid JD7,5 each ($11) for a two-day pass after student discount. The girls that we shared that taxi ride with yesterday were already somewhere in Petra and we were sure to bump into them sometime during the day – which we did. Soon after entering the site, we bumped into a Dutch couple that we had noticed were in our hotel last night. We chatted with them and exchanged travel anecdotes. They are also travelling around the world and we seemed to have quite a bit in common so we decided to spend the morning together examining Petra’s hidden corners. 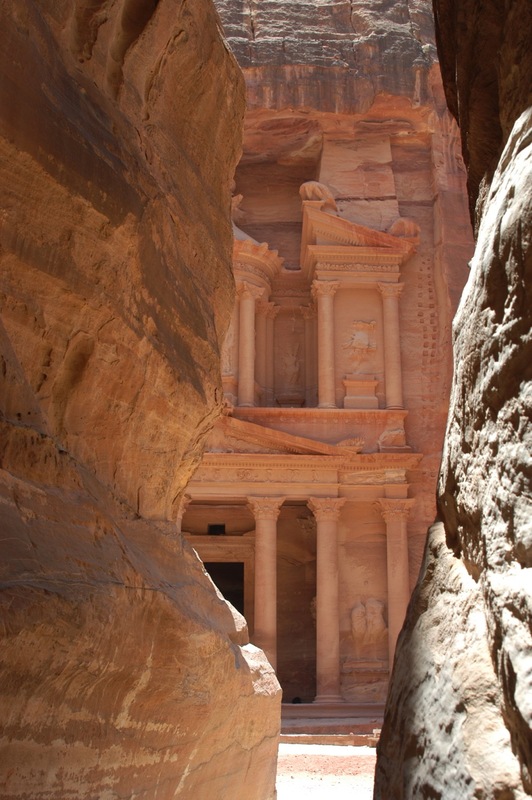 They had already been to Petra yesterday and were now interested in seeing an out of the way tomb that was only reachable via a rocky gorge. We joined them for the forty-five minute hike. It was an interesting hike to say the least. We traversed a very narrow and winding path for the better part of an hour. Parts of the hike were nearly impassable and there were a few times where all had to help each other climb over various rocky obstacles but we all made the best of it and generally enjoyed each other’s company. We parted company at around midday, just shortly before briefly bumping into the two girls from yesterday. Petra is an amazing place. It is a series of valleys and hidden rocky escarpments out from which various dwellings and intricate buildings have been carved. What was once solid rock has been turned into some magnificent building facades by means of some astounding sculpture work. Each corner we turned revealed more of these works of art and we could have stayed there for hours just looking at them in awe. Already weakened by the strenuous hike and the blistering heat (not to mention the fact that we had underestimated how much water to take along with us), we decided to cut our day in Petra shorter than we could have. The walk back to the main gate was all uphill and this took yet more out of us. We were going to take one of the horse and carts that were offered to us on the way in but the opportunity to grab one didn’t materialize. One thing that did work to our advantage was the slow tourism trade. As opposed to several thousand visitors marching through each day, there was just a small handful today and we got to take some nice photos without the irritation of dozens of other people getting in the way. The same Japanese contingent that we first saw in Nuweiba was walking around so we gave them a wide berth. Of the two main attractions at Petra, we got to see just one today (the treasury) but the other (the Monastery) is quite comparable to the first so we left with the feeling that we had seen everything there was to see. In actual fact, we could have spent several more hours there but we would only have seen more of the same and it was a very long day already with a lot of strenuous walking around and little to no shade to shield us from the overwhelming heat. We had the taxi driver drop us off at the Internet Café that we visited yesterday and enjoyed some junk food. We were cutting things very close with our time here in Jordan so I called the airline to push back the date of our flight out of Amman by another two days. We will decide how long to stay in Dubai after we get there and check the place out. I was getting very frustrated with Internet Café network because I couldn’t seem to access and of the Internet resources that I needed to use (Yahoo mail, Mac mail and iPhoto home page primarily). By the time we got back to the hotel, our irritability levels were quite high and we weren’t talking for a while – enjoying a little quiet time away from each other does the world of good from time to time. Later on in the afternoon, the French girls and the Dutch couple returned from their sightseeing. The Dutch couple had hooked up with a South African couple and the six of us went back to the Internet Café again to grab a light snack before they took a taxi ride to Mataba. I burned the Dutch couple a CD full of the photos from the day and we exchanged contact information before bidding farewell. Since the French girls are going back to Aqaba tomorrow, we now needed to decide what to do next. We had already paid for another day to Petra but we both thought that we had seen everything that we wanted to see and another day in the sun was not looking too appealing so we contemplated the idea of taking the King’s Highway route up to Amman. This trip would take an entire day by private car and would take in several sights of interest along the way, including a couple of hours in the Dead Sea. At JD60 ($90) for the car, however, it was not a cheap day trip (especially since we no longer had anyone to share the cost with) but it would at least solve a couple of logistical problems for us - we would get to see the Dead Sea as well as getting to Amman. I spent the better part of an hour haggling with the guy at the front desk about the cost of the trip and eventually managed to shave JD5 of the price. We will pay the driver $80 at the end of the trip tomorrow, after he puts us off at a hotel somewhere in Amman.